The Career & Technical Education (CTE) program in Madison is designed around several career pathways to cultivate the potential in our students by integrating rigorous classroom instruction with relevant, work-based experiences that inspire, guide and empower them for post-secondary college and careers. Our Career Pathways are constructed as a journey of exploration that is specifically designed to engage the learner in an interest or possible career path. Courses are designed to spark interest, capture the possibilities in the field, and allow students to experience work as novice practitioners. Our courses offer challenging, engaging, effective and relevant curriculum that includes technical knowledge, skills and academics foundational for our students’ success in the real world. To teach technical skills through a career lense effectively, teachers need strong content knowledge along with instruction revolving around work-based experiences. The curriculum in CTE is organized around five of the 16 federally recognized career pathways. A career pathway is defined as a concentration in a particular field of study through a sequence of courses which lead to the development of a particular set of knowledge and skills aligned with career interests. These pathways provide guidance through essential knowledge and skills for students to discover their interests and their passions, and empower them to choose the educational pathway that can lead to success in high school, college and their career. 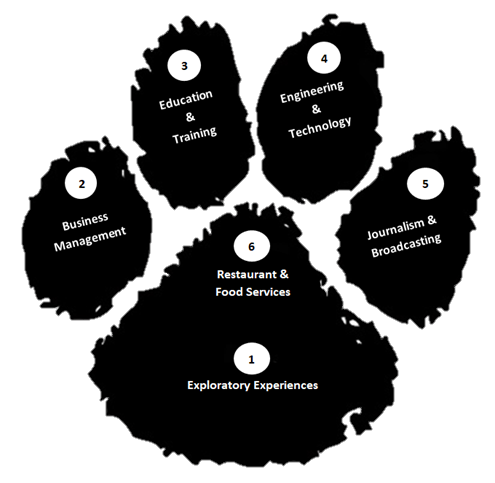 Each pathway has career specific knowledge and skills that are a comprehensive collection of industry-validated expectations of what students should know and be able to do after completing instruction in a career program area. Planning, managing and providing scientific research and professional and technical services (e.g., physical science, social science, engineering) including laboratory and testing services, and research and development services. The management, marketing and operations of restaurants and other food services, lodging, attractions, recreation events and travel related services. The Madison Career & Technical Education curriculum is created with the district priorities represented in the mission statement, the 21st Century Capacities matrix and is aligned with the CSDE Career & Technical Education Performance Standards and Competencies. The integration of these standards guided the development of K-12 Transfer Goals, which are all aligned with specific district 21st century capacities and are most frequently revisited and assessed in curricular units throughout a student’s academic career. 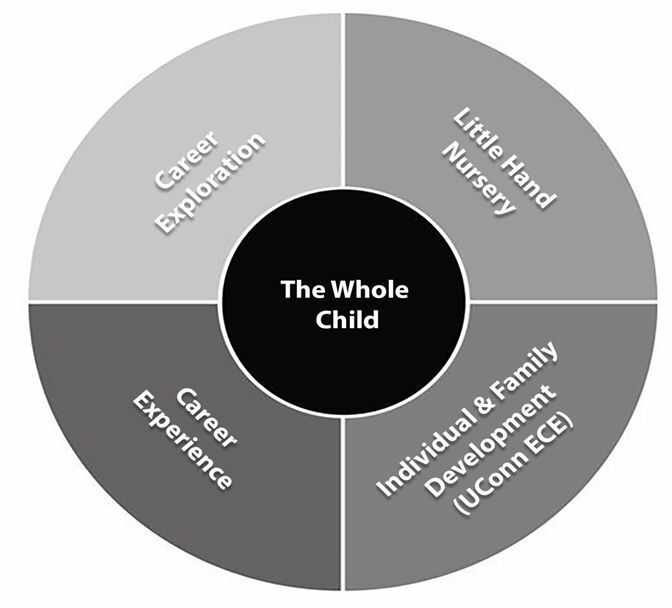 Long-term aims of the PK-12 program. An overall end result of a student’s education in Madison. Communicate effectively based on purpose, task, and audience using appropriate vocabulary. Demonstrate professionalism through exhibiting attentiveness, growing from feedback, and adhering to industry standards (safety). Leverage connection(s) in other subject areas (including STEM) to make sense of a given problem, product, or solution. Develop a product/solution that adheres to key parameters (e.g., cost, timeline, restrictions, available resources and audience). Demonstrate fiscal responsibility through examination of needs and wants, development of short and long term plans, and/or conservation of limited resources. Work together on a common goal to meet deadlines through addressing challenges and problems along the way both individually and collectively. Students will learn about the different facets involved in game design. Using Scratch, and its block based language, students will develop, test, and debug a game. Students will have the opportunity to create their own sprites and worlds as part of their iterative design process. In the PBA, students will innovate an existing game in making it more challenging and fun to play. In this second unit of study, students will collect data on the game they created, learn how to input the data into a spreadsheet, and then graph the data in a meaningful way. Students will learn the basics of spreadsheets through the use of Google Sheets. In this performance task, students will apply these skills in displaying the game play data collected from their peers' rating of their game, before and after their modifications (PBA from Unit 1). Students will learn about the different facets involved in animation design. Using Scratch, and its block based language, students will learn how to develop, test, and debug an animation. Students will have the opportunity to learn how to create their own sprites, adding conversations, switching scenes, adding interactions and adding voice as part of their iterative design process. A PBA will have the students create an animation (story) based on a narrative written in fifth grade. This process will include a peer review element in which data will be collected for use in Unit 2. This unit continues the students' journey into coding by having them collect and analyze data on the animation they created. This will involve placing the data into a spreadsheet, graphing the data in a meaningful way and learning how to analyze data using statistics. In this performance task, students will apply these skills in analyzing the data collected from both of their peers' ratings in evaluating their growth between the "favorite food" and "narrative" animations. In this unit, students will learn about Boating Safety. Although there are inherent risks in virtually any sport, a well-educated boater who uses common sense and courtesy on the water contributes to everyone's safety and enjoyment. As a result of the content in this unit, students will be eligible to obtain a Certificate of Personal Watercraft Operation through the CT Sportsman Database. This is required to operate a power boat or vessels over 19 1/2 feet on all state waterways. In this unit, students select a plan and construct their own boat with available plans ranging from small plywood canoes to a 14' skiff. Full scale boat construction will be the major component of this unit. During the building process students will hone their ability to properly manipulate tools and understand the importance of proper preparation. In the first unit students will explore careers and simulate the job finding process. Students will conduct self-exploration to determine what careers interest them, what type of work is best suited to their personality type. Students will write a resume and cover letter, learn proper job etiquette and professional behaviors. The PBA has students creating a job prospect portfolio that includes their work-style, career interests, performing a job search, writing a cover letter and tailoring their resume towards that job. Students will go through the job interview process (prepare, communicate, reflect) by engaging in a face to face interview. After the interview students will reflect on their performances in determining next steps. In Unit 1 students go through the process of exploring careers and finding a job of interest. Unit 2 has students moving on with the next part of living independently which is to learn about finding apartments, determining options for transportation, meal planning, and responsible use of financial products. Students also learn all the of intricacies, added costs, and maintenance that comes along with ownership. Students also learn how to calculate their monthly net pay and the fundamentals of budgeting to live on their own. The PBA has students develop a spending plan to ensure they are being financially responsible as they make choices on living arrangements, transportation, and other expenses. This unit focuses on the role of business in the economy, and how economic trends affect business. They will demonstrate business acumen through examination of needs and wants, development of short and long term plans, and/or conservation of limited resources. A PBA will have students synthesize information about a business from the TV show "Shark Tank" and develop solutions to potential business growth problems. 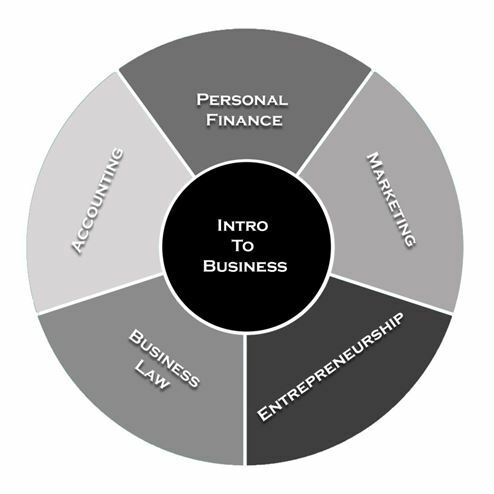 Students will focus on the structure of business including: types of business ownership, and the roles of management. Students will study the functions of a manager, and learn how managers can motivate their employees to perform. The Shark Tank PBA Part 2 will have students act as a consultant for a business and give the business advice on their business structure, employee motivation, and ethical behaviors. This unit will focus on several business activities such as accounting, marketing, and hiring/personnel that are essential to succeeding and managing a business. Students will use their knowledge of accounting to make financial forecasts and projections. These activities will also coincide with learning how to create a business plan which will be a major focus of the following course; Entrepreneurship. A PBA will have students develop the idea of a Food truck business, and will produce a mini business plan. In the Entrepreneurship course, students will gain hands on experience of running a business as a team. In unit 1, students will work in smaller groups to develop a business idea. In the PBA, students will create a mission statement, what separates their business and makes them different, and then create a survey to research what the perceptions of their market are. Students will then take the information and their idea and give a sales pitch to the rest of the class as to why their product should go forward into being sold. In Unit 1, students developed a business idea and pitched it to the rest of the class. From those pitches, two ideas will be selected to go forward in unit 2. Students will be part of one of those two businesses, and will assume a role within a department where they will have specific responsibilities. The PBA, which encompasses the whole unit, asks students in their departments and within their business to develop a comprehensive business plan. As students continue to work on the business plan they should be holding regular business meetings to ensure that each department is working together and communicating. Students will carry out the operations of their business and sell their product. This includes tracking revenue, inventory control, marketing and selling of the product. The PBA has students give a report on their performance as well as discuss strategies for growth if the business were to continue. The last unit of Entrepreneurship is the culminating final project (to be used as final exam). This allows students to take their own idea for a business and develop it. Students will then be asked to create a visual as part of a gallery walk display. One of the challenges in Marketing is being able to strike an emotional connection with consumers. This unit looks at how a company builds a brand to connect with consumers. Students will look at how a company positions themselves in a competitive market, and how that influences the brand message that they communicate to consumers. Students will also learn how to decode messages to learn what an advertisement is really saying and how the emotional appeal by the company shapes the brand. The PBA gives students the beginning of a case study about Real Burger World (a non-fictional business) and asks them to build their brand and message. In unit 2 students will learn that trying to meet the needs and wants of everyone is very difficult, therefore businesses must focus their marketing efforts on a specific target market. Students will learn how the market gets segmented in order to create a target market. Students will then study how the decisions and strategies made in the marketing mix (product, price, place, promotion) must directly reach the target market and satisfy their needs and wants. Students will then use Ansoff's matrix to determine how to extend the product life cycle and adapt their marketing mix to the new strategy that was made. The PBA of the unit asks students to visit the New Coke case study, and come up with an alternative strategy that would have been effective in the Cola wars by developing a comprehensive marketing mix for different target markets. Corporations bring in billions of dollars a year in revenue while providing us products to satisfy our wants and needs. Because these corporations and businesses bring a lot of money we look to them to give back to our community, the marketplace, environment, and employees. We look to them to give back because as San Antonio Spurs coach Gregg Popovich said "Because we're rich as hell and we don't need it all, and other people need it." This unit looks at how corporations are socially responsible and give back to society, with a focus on the impact their decisions have on the marketplace, community, employees, and environment. Students will analyze the actions the company takes to be construed as "window-dressing", and how those actions correlate into an increase of brand image, revenue and profits. The PBA asks students to act as a consultant for the Madison Beach Hotel and develop a comprehensive social responsibility plan that is feasible and can help achieve an increase of brand image, revenue and profits. In this culminating experience, students will create a Marketing plan for an existing company that is in decline. This marketing plan will act as an all encompassing PBA and final exam for the entire course, allowing students to demonstrate a comprehensive understanding of the concepts acquired throughout all the units of the course. The PBA will ask students to perform a situation analysis, description of the target market and position, develop goals for the business, develop marketing strategies and communications, as well as a marketing budget. In Unit 1 of Personal Finance students will get the chance to explore potential careers and the education/training needed to perform those jobs. From those career choices, students will find an entry level salary, which they will use for the activities throughout the unit and the PBA. The essence of the unit has students calculating net pay as they learn about the income tax process and deductions from a paycheck. With their net pay, students learn the importance of a financial plan and sticking to a budget. The PBA will have students act as a financial planner in creating both a financial plan for a client with a specific profile, and a spending plan (budget) that aligns to the financial goals outlined in the financial plan. In unit 2 of Personal Finance students will delve into the landscape of financial institutions. Students will learn how to evaluate a checking account and savings account offer from a bank so that they are an informed consumer. Students will also take the perspective of the bank to decide how they choose whom to give a loan. The PBA asks students to compare checking accounts and savings accounts from banks to determine which account best fits their needs. In unit 3 of Personal Finance, students will delve into the costs and risks associated with using credit. Students will explore how a credit score increases and decreases, and how a credit score will affect your life. Students will also be able to calculate how much interest is paid over time as the cost of using credit, as well as the dangers a credit card brings to one's finances. Students will also learn about the risks of identity theft and how to protect themselves. The PBA asks students to compare and choose a credit card that fits their needs, and then write a letter to their parents explaining why they should have a credit card, demonstrating they have the knowledge of how a credit card works and can use it responsibly. In Unit 4 of Personal Finance students will learn the basics of the stock market and how to analyze stocks. Students will take a look at the company as a whole, and their recent performances to determine if the company is worth investing in. Students will learn how events, news, and other factors such as psychology, and fear play a role within the stock market. Students will learn basic stock analysis of popular key indicators such as EPS, PE Ratio, and market cap. The PBA asks students to prepare a report for a client that analyzes a stock, makes an investment recommendation, as well as a prediction of where the price will be in one and five years based on their research and analysis. The nature of this course will revolve around designing a house on a piece a property for a given client. This process will take place over two units in which they will focus on developing the proposal (Unit 1) and carrying out the proposal in creating the home design (Unit 2). In Unit 1, students will get the experience of acting as an architect and dealing with a client in developing a proposal to meet their needs. This unit focuses on the conceptual design of residential buildings with emphasis on preliminary design development and model building . Emphasis will be placed on developing the student's ability to research, analyze, and evaluate information from the client as the design evolves. The PBA will have students prepare a conceptual design of a home for review by their given client. In Unit 2, students will be carrying the conceptual design of their client to fruition. Emphasis will be on learning how architectural software can assist in the design process by modeling, visualizing and analyzing building designs. The PBA will have the students creating the artifacts (working drawings, visual tours and presentation model) for the presentation to their client for final approval. This unit introduces the student to concepts and tools for producing solid models that can be efficiently manufactured in an engineering shop. Students will learn and apply the major processes (Sketching, dimensioning, Extrude, Shell, Revolve, Sweep & Loft) within a 3D modeling software (SolidWorks) in creating solutions (models) to a variety problems. Student will learn these skills/processes in a collaborative fashion with their classmates through conceiving, designing, modeling and creating working prototypes for testing by using 3D printing technologies. The PBA will have students design and 3D print a cell phone stand/audio enhancer. This second unit focuses on the methods needed to create a working drawing that is functional and prepares a person or computer to build/construct or machine a part. Orthographic projection is widely used in engineering practice to make working drawings. Engineers are required to design, revise, analyze, and/or construct complex parts or systems. These parts or systems, are conceived or exist due to working drawings. A working drawing, is usually the last drawing produced by a designer. It normally has three accurate views of a product, a front view, side view and plan view, dimensions (measurements) and a bill of materials. The PBA will have students go through the whole process of designing a paddle boat from creating a full set of working drawings, building a model prototype then making corrections to the working drawings. In this unit, students will learn and apply the 8 step Engineering Design Process that is the basis of any engineering process. They will also learn basic safety protocol before they attempt to solve challenges in a shop-based environment. Students will take a short safety exam to ensure that they can work in a safe and respectful manner. 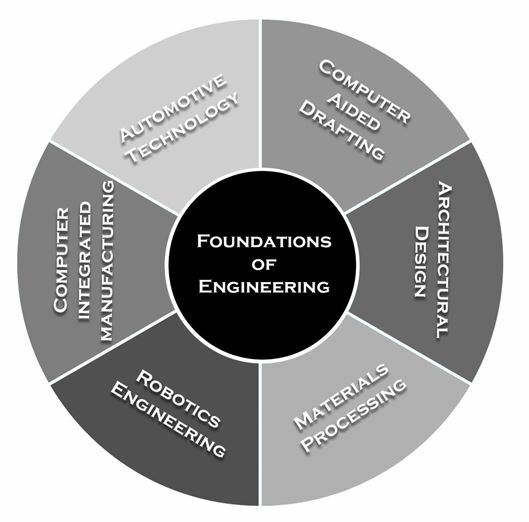 The goal of each student is to learn Computer Aided Design (CAD) software to develop and then build an individual link that will become part of a class chain. The student will ensure that their design fits within the class chain which requires significant problem solving both in the initial CAD design and build as well as troubleshooting via collaboration with other students to ensure a proper fit. In this unit, students will apply the 8 step Engineering Design Process to design and create a solution to a complex problem. Students will go through the process in designing a CO2 dragster that will compete in a replicated drag racing event. Students will apply safety protocol as they design, create and test their CO2 dragster to be built for speed. Students will spend a significant amount of time assessing their dragster in a variety of tests and analyzing the data to help them predict the outcome of their design. During this whole process, students will document their work in their engineering report with the final analysis being done at the end and submitted. In this culminating experience, students will be asked to apply the Engineering Design Process in solving a challenge. This solution will act an an all encompassing PBA and final exam for the entire course. Students will get the opportunity to research engineering careers and find out through several tests what kind of engineering they could be based on how they answered the questions within the test. The PBA will ask students to create a solution to a problem through the lens of their selected career within the field of engineering. Students will be introduced to the fundamentals of building and programming a robot to do specific tasks. Implementing the Engineering Design Process throughout the course students will work respectfully and responsibly with others in exchanging and evaluating ideas in building and programming a robots performance. Utilizing engineering notebooks as a tool, students will also be expected to document and analyze their performance throughout the process to evaluate progress in determining their next step. A PBA will have students develop an autonomous program for their robot to perform a "Programming" challenge for the current VEX EDR game. In order for the overall robot to function effectively, each of these systems must work together. Students will be asked to utilize any two of these five subsystems along with accompanying Engineering Notebook entries as part of the overall design process. In order to design any one of these systems, one must have knowledge of all the others which will be briefly informally discussed throughout the unit. Any requirements on the way these subsystems interact as part of the systems integration would be treated as Specifications (design constraints) in Step 3 of the design process. The PBA will span most of the unit and have students develop a robot to compete in the "Skills Challenge" the current VEX EDR game. The Engineering Notebook will be graded after each learning activity and transfer task. Students will be introduced to the world of moving pictures and the difference between capturing film and video. They will learn the importance of, and practice, proper camera and tripod setup, shot types and moves, white balance, exposure, and stabilization. Students will learn "how to properly capture a moment" which will act as the foundation for all future video endeavors. A PBA will have students create a reality TV Show introduction. 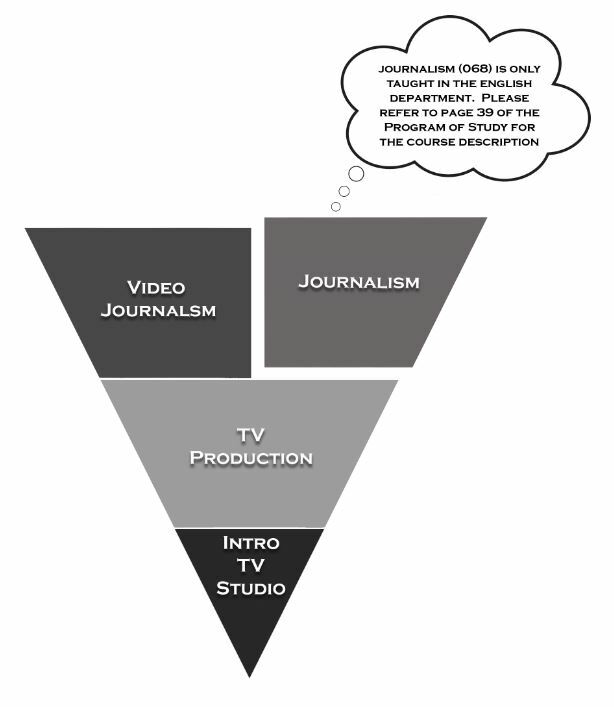 Students will learn the terms and techniques of the phases of production, video sequencing, and non-linear editing software. While going through the three production phases, students will create their first sequence to convey a complex message to the audience. New sequencing concepts such as continuity, 5 second rule, 180 degree rule, will be applied and the computer editing process will be explored. In the PBA, students will imagine a unique way to create a video product that expresses a complex idea of "wisdom". Students will learn the proper techniques to capture high quality, external microphone audio during production, and the concepts required to operate a Digital Single Reflex Camera (DSLR Camera). The PBA will have students imagine and create a video that conveys a metaphorical idea. Video is an important communication tool that should be used for a reason: social awareness or change, news, entertainment, fostering community and culture. Students will use all of their production skills to create an effective civic message. In groups students will create an idea treatment, then Write, Film and Edit a Public Service Announcement for a Civic Need. In this culminating experience, students will create a video Public Service Announcement. This public service announcement will act as an all encompassing PBA and final exam for the entire course, allowing students to demonstrate a comprehensive understanding of the concepts acquired throughout all the units of the course. This introductory unit focuses on the basic, essential skills needed to operate in the culinary industry. These skills revolve around safety and sanitation, kitchen tools & equipment, measuring and conversions, reading a recipe and introductory cooking methods. Through hands-on activities this unit helps students learn a variety of different cooking techniques along with skills used in the Restaurant and Food Services career pathway. Our Restaurant and Food/Beverage Services career pathway will provide opportunities for our students to learn and perform a variety of tasks needed to maintain operations and promote guest services in eating and drinking establishments. In the PBA, students will apply their skills and knowledge within safety and sanitation, measuring, cooking techniques and reading a recipe in preparing a rice pilaf dish. In this second unit of study, students will continue to learn how to cook different foods with varied cooking methods and also learn how to identify and combine the characteristics of foods and select the best cooking methods in creating edible dishes. The PBA will have students apply these skills in creating a delicious appetizer using specific ingredients along with a mystery ingredient. This final unit of study will serve as the final examination. Students will learn how to plan and prepare a cohesive meal. There will be a focus on consumer skills and budgeting. The PBA is a comprehensive project where students plan and prepare a meal for guests. This includes menu planning, budgeting, shopping, food preparation, hosting, and cleaning.